This, above, is the thought that occupied my mind as we counted down the days until my husband left for his new job. I jotted down the quote I came up with so I don't forget. It's the first time I'm away from him since we got married. It's day five and I'm holding down the fort with the kids for another two weeks at least! I have a new-found respect for single parents and military spouses. I now know what the phrase "I'm not a single parent, but I'm parenting alone" means. Wives of truckers, oil rig workers, those in the service, etc. Honestly, my workload isn't much different than what it was when he was here. He worked outside the home 8-9 hours a day on a second shift, mornings he slept in. I mostly handled all of the housework, homeschooling, meal prep, and my own work running three small businesses. The only thing that's really changed now is he isn't here. It's amazing how much of a difference just the physical presence of a person you love makes. I knew that I could call him at work and he would come home if something urgent comes up. I knew I could count on him having breakfast with us a few days a week. I knew I could tell my preschooler "You better behave or daddy will come home and I'll tell him everything!" I noticed also how much harder it is to take better care of yourself when you're parenting alone. Sleep, showering, eating healthy suddenly aren't so easy, it really takes an orchestrated effort. I am so blessed to be surrounded by many friends and family. In fact there are few days we're not visiting someone or someone isn't visiting us. Paired with the fact I've been making sleep a priority, I have a hard time squeezing in those minimal 5 hours of work each day! So things are very different here at Eco-Babyz. I have so much to write about and so many photos I've taken for blog posts. But life has other plans. My priorities right now are on kids and paid work, as we have no idea when hubby's next 'new job' paycheck will come in. I'd also love to see more photo sessions in the near future as spring rolls around. It's scary to embrace change. To walk right into it. To let go off the familiar. We are now both business owners by choice. Self-employed, words that are now part of our daily vocabulary. At the same time it's exhilarating! A change of pace can be inspiring. We discover new things we've never known about ourselves and those we love when we escape our comfort zone and learn to trust a little more than we did the day before. 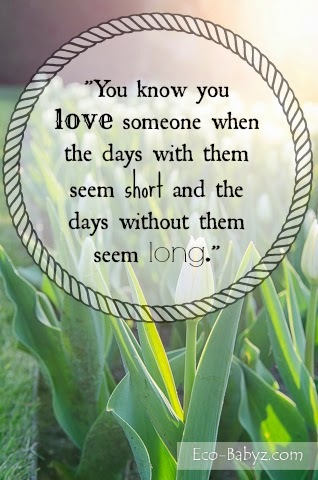 "You know you love someone when the days with them seem short and the days without them seem long." What recent change in your life has been liberating and/or scary for you? Are you ever left parenting alone? Photo: V & A Photography, Tulips in bloom in Boston, w/my own words overlay. Yes! I only have one child, our daughter, almost 4 now, but it gets lonely! My husband recently switched shifts at work, so we get to see him more in the evenings, but it is hard to get in family time AND Mommy/daddy time. We have dinner together, which has been frustrating with a toddler that doesn't eat most of the time, and then we have a few hours before he needs to go to bed and quiet time is in the house! I take my daughter out on Saturdays when MY Self Employment is put on hold, and we go to the library, or grocery store. It helps pass the time, a little, but with no nearby family and friends scattered across the US, it is just us 2 so much of the time. I find when I immerse myself in something, work, or on the down time, my girl, then the time is enjoyed more than used missing him..... The days will pass by so fast you will be seeing him before you know it!